Something happens when you grow up. Things that used to be shiny lose their luster. Things that used to thrill you seem ho-hum. The weeks leading up to Christmas are often stressful, not exciting. The family evenings at home can feel like a long list of chores, not joyful time together. As a mom, it’s easy for me to get into the habit of just giving orders: Take the trash out, please. Time to eat! Make sure you brush your teeth. Put your dirty clothes in the laundry room. Stop touching things we’re not going to buy. Pick your stuff up off the floor! I want to change all that. I want to slow down and enjoy. 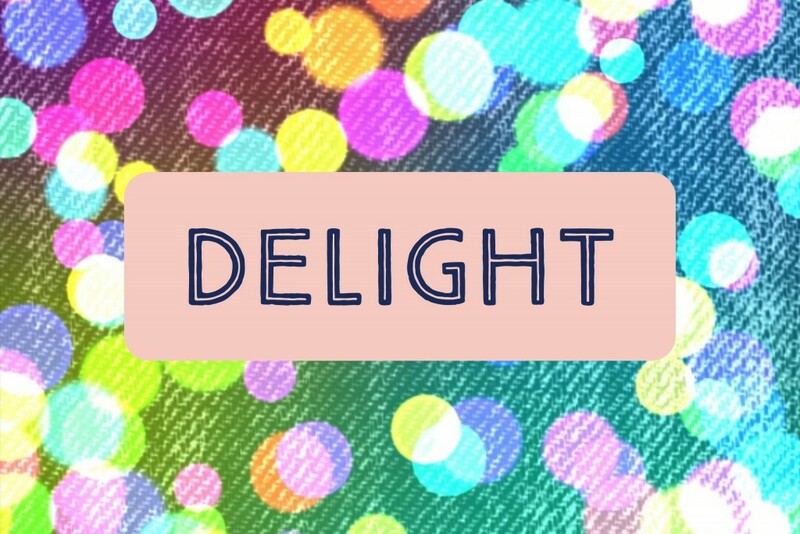 I want to delight in my life. I want to delight in my children. I want to focus on their strengths and quirks and interests and spirits. I want to be more than just tired, overworked mom who barks orders. I want to enjoy my children and let them know how much I treasure them. I want to delight in my marriage. We worked very hard on our marriage in 2016, and I want to continue the work, because we are in a good place right now, a better place than we’ve been in quite a while. Oh, we still argue sometimes, but overall we enjoy each other and appreciate each other more than we have in a while. I want to keep that up. I want to delight in my family and friends. I tend to be a pretty bad friend since I have so many family commitments right now (volleyball/basketball/minivan mom, at your service), but I want to connect online less and connect in person more. I want to do things for fun. I want to create a burlap pennant banner for the living room and print and frame some cute little signs for the laundry room. I want to host another coloring night for my friends. I want to print out more photos and hang them up in the house so we can remember fun times. I want to go ice skating and do one of those escape game things and dye a strip of my hair pink. I want to delight in nature. Take more walks. Go on some day hikes. Sit out on my deck more. I want to delight in my own creativity. I plan to (finally) paint my office this year and make an inspiration board to put up by my writing desk. I want to enjoy creating words that delight and challenge and reach people. I want to create a little more good in the world. Somehow, I want to delight in loving my neighbor. I’m not sure how yet, but I think I need to stretch out of my comfort zone and grasp the hands of those around me. I want to laugh. I want to wash my life with color. I want to smile more. I want to delight in the little joys of life. Here’s to 2017. My year of delight.